Maybe you are reading this article because you are almost ready to have the final draft of your thesis or research paper proofread. A thesis represents many months, or even years, of research. You have put in the hard yards: read, researched, reviewed, revised, and carefully edited your thesis, checking that your arguments really get you, logically and clearly, from the aims to the conclusions. Right? You have read through your thesis many times to check for clarity, spelling and punctuation errors, or inconsistencies in formatting and the citation style. Whether you have written a minor thesis (Honours), a Masters or a doctoral thesis, there comes a time—a moment—when you breathe in deeply and tell yourself: that’s it. However, it is common knowledge that when writers read their own work (over and over) they often become ‘blind’ to grammatical and spelling errors. Handing your thesis to a proofreader who has never read it will provide a ‘fresh eye’ to pick up any mistakes that you may have missed. This last step is important for your peace of mind. You don’t want examiners to find minor grammar errors and inconsistencies throughout your thesis; this sends a message that insufficient care was taken in the final stages of the thesis presentation. Full-blown editing of a thesis is unacceptable and unethical. 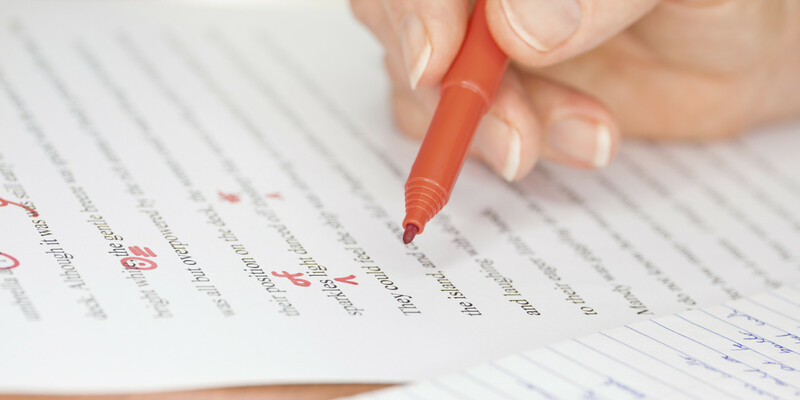 A supervisor or a proofreader may draw the thesis writer’s attention to any issues that may need to be addressed, but should not provide solutions. It is expected that the academic supervisors of higher degree research students will offer their students editorial advice relating to matters of substance and structure. The thesis structure organises the material to help create a readable narrative (what you are trying to say): a flow that will make sense to an audience (the reader). This may sound like something that only a writer of fiction would need to know, but it is the most important lesson any writer can learn. If you keep a narrative flow in mind as you write your thesis, you will turn a good thesis into an excellent one (source: ‘How to Write a Better Thesis’, Evans, Gruba, Zobel, 2011). In the interest of readability, it is also important to decide what nomenclature you intend to use. Recently, I proofread a doctoral thesis in which the author mixed the nomenclature. At times she wrote in the first person: I argue; and other times she used the third person: the researcher argues or this thesis/this study argues . . . Sometimes this leads to ambiguity and I frequently had to read a paragraph multiple times to establish if the researcher was referring to the thesis author or the researcher who wrote the paper being referred to. I advise discussing whether to use the first or third person with your thesis supervisor, and making a decision as to the point of view or voice that best suits your thesis topic. I have found that, in general, science and mathematics thesis writers tend to use the impersonal passive constructions; e.g. It was observed that, or changes have been seen to be successful. Thankfully, these days, more and more thesis writers are being encouraged to write in the first person, active voice; e.g. I observed, or changes showed that. The following is an outline of what I do when I’m asked to proofread a thesis, which will provide you with tips before you decide to pay for a proofreading service. I make sure that the writing is free from punctuation, capitalisation and grammatical errors. Punctuation may need to be added to a sentence to improve clarity, or the incorrect punctuation may have been used. Capitalisation is often a contentious issue; basically, if the word isn’t a proper noun then don’t capitalise, but I always advise the thesis scholar to check with her or his supervisor, who may have other ideas of when to capitalise and when not to (I have written about capitalisation here and here). I look for spelling errors and malapropisms (using an incorrect word that sounds the same as or is similar to the appropriate word by mistake. For example, ‘complement’ rather than ‘compliment’, or ‘their’/‘there’) that spell-check will not identify. Typical spelling problems that spell-check won’t pick up are incorrectly spelt proper nouns, such as people’s names and places. If necessary, I make suggestions for improvement of sentence and paragraph construction. Some thesis scholars are naturally skilled writers and write fluent sentences that communicate the intended meaning with ease. Other thesis writers have writing styles that produce awkward, disjointed sentences, or verbose and impenetrable paragraphs (which perhaps they think will impress examiners!). Simple, direct words and sentences that reflect critical thinking impress examiners more than wordy, obscure, roundabout language. I check that each paragraph introduces one main idea. Does every sentence in the paragraph help to develop that main idea? I also check for redundancy and repetition. I make sure that the nomenclature is consistent. If I do identify the mixed use of the first and third person then I will bring this to the writer’s attention before proceeding. I check that there are no style guide inconsistencies, particularly in citations and the bibliography. One last note: if you pay for the services of a proofreader, be prepared for constructive criticism of your writing. Don’t be defensive, but open-minded. Sloppy writing that is left unchecked will undermine the value of your thesis. So be grateful for at least a second opinion that you can either accept or reject. That brings me to how I proofread theses. I usually proofread a thesis on screen using Microsoft Word’s Track Changes facility. This means that every change I make is ‘tracked’, and queries are inserted as comments in the margin using the Track Changes comments feature. When I have finished proofreading your document, I will return it to you showing the track changes and any comments will be located in the right hand margin ‘comments bubbles’ for you to consider. As you read through the tracked-changes, you can either accept or reject each suggested change. The thesis is, after all, your work, not mine. After the proofreading has been returned to you, and once you have completed the laborious review process (again! ), which may involve minor improvements and corrections, I recommend that you return your thesis to me for a final read through. A few new errors have a habit of creeping in once the messy tracked-changes are erased and changes made. But don’t short-change yourself or take short cuts when facing the final hurdle—stay committed to submitting the best thesis you are humanly capable of.
. . . I would also like to thank Denise for her incredible help in the proofreading process during the last leg of this journey. If you would like me to provide you with a quote to proofread your thesis, please contact me using the message form on my Contact page. I will require information such as the subject of the thesis, the word count and an idea of the date required for completion of the proofreading. I will respond within 12 hours.